Whether used in conventional or hybrid-electric powertrains, the gasoline engine is likely to remain a dominant source of motive power for passenger cars for many years to come, particularly in the mid- to premium-size vehicle sectors. A key challenge, therefore, is to develop a new generation of gasoline engine technologies that are significantly more fuel efficient under real driving conditions than today’s products, and which meet future emissions legislation while offering competitive performance and affordability. In the presentation A New Generation of Lean Gasoline Engines for Premium Vehicle CO2 Reduction, part of the ‘Electrified Engines’ session of FPC2019, Ricardo will outline some of the results to date of the company’s work on the PaREGEn (Particle Reduced, Efficient Gasoline Engines) project. 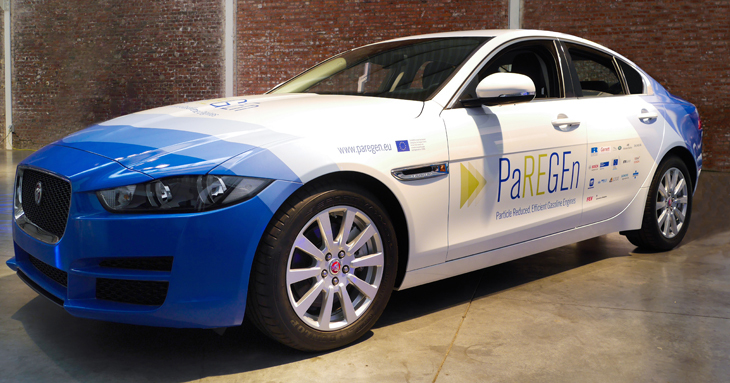 Supported by the EU Horizon2020 framework programme, PaREGEn is a seventeen-partner research activity which, through the use of state-of-the-art development techniques and the application of novel engine componentry, is identifying the optimal trade-off between cleanliness and efficiency in the next generation of gasoline engines. In particular, the project seeks to develop the capability for designing future gasoline engine technologies for mid- to premium-sized passenger cars that demonstrate a fifteen percent reduction in CO2 emissions under Euro 6d RDE legislation, and control of particle number emissions measured down to 10 nanometres. Ricardo and its partners in the PaREGEn project are developing a two-litre turbocharged, direct-injection gasoline engine, with a lean-homogeneous combustion system matched to a lean- and stoichiometric-capable exhaust aftertreatment. As will be related in the presentation, initial vehicle-based tests have shown that the engine technology package is able to realize a substantial reduction in fuel consumption and to switch successfully between stoichiometric and lean operating modes in a range of conditions. While work remains to be done in the PaREGEn project, these initial results provide significant confidence that the consortium is on track to achieve the prescribed fifteen percent reduction in CO2 emissions, meet Euro 6d RDE emission thresholds and deliver particle reduction down to 10nm.